Watch Rat Pack Jazz on YouTube. These gentlemen provide a strong vocal and guitar performance of the musical standards of Frank Sinatra, Dean Martin, Tony Bennett and Nat King Cole. These wonderful classics from the golden era of song are delivered by this nationally experienced duo, or with the support of additional bass, piano and drums. Johnny and Ron have been performing regionally and across the country for three decades. They always deliver a top-notch level of entertainment sure to please the listener. A guaranteed music event to be remembered by all can be provided as a duo, trio, quartet or quintet. Adams & Cooley are true professionals in every sense of the word. They were very easy to work with and their musicianship is "A List" all the way. For one evening our auditorium became "The Sands" with the music of Rat Pack Jazz. It was a pleasure to work with you and your group, and even more of a pleasure to listen to the wonderful music you created. The pre-planning and the concert itself went off without a hitch, and it was enjoyed very much by all who attended. Continued success to you! Rat Pack Jazz, Adams and Cooley, at their Valentine performance in David City included great music along with delightful humor. Johnny and Ron make the classic vocals and musicianship of Sinatra, Cole, Martin and Bennett their own, while retaining the nostalgia of those golden years. 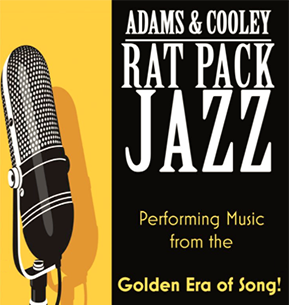 We were very pleased to have Adams & Cooley perform a program titled "Rat Pack Jazz." We certainly recommend them. They had excellent rapport with the audience along with very high quality talent! They were very professional in performance and easy to work with in planning. Special presentations and workshops can be arranged.